Since we have always had a house at the shore, family barbecues over the 4th of July weekend have been at our house (Ocean City until 1993 and then Sea Isle City). We traditionally enjoy the beach during the day and then return to the house for a barbecue later. 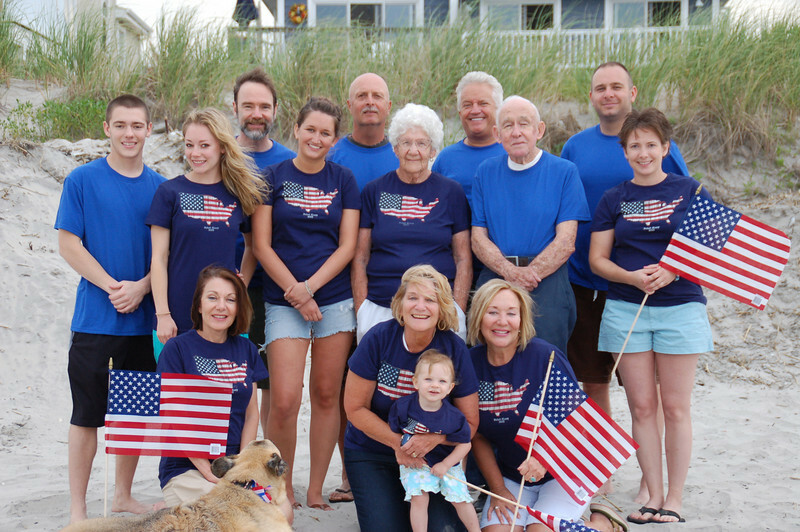 This year, Aunt Aunt Janice & Aunt Susan purchased matching t-shirts for a family portrait on the beach after dinner. Casey thought the idea of matching shirts was "queer" and would have preferred that everyone wear their own clothes. She cooperated, but after about 3 or 4 shots, announced that that was enough! We then all played on the beach abit before heading back to the house. Front row: Dianne (Casey's Mom) with Nikki, Aunt Susan with Kadence and Aunt Janice. 2nd row: Brett, Casey, Cousin Jamie, Mom Mom & Pop Pop Anderson and Melissa. Back: Joel (Casey's Dad) Uncle Jay, Uncle Jim and Cousin Chris. Beautiful pictures that ironically were taken the last time the family was together for a picture. Casey's passing only about two weeks later make this photo even more precious.